A little yoga before bed can be a great way to wind down the body, and mind too, and prep for a good sleep. Here are three poses for a relaxing bedtime sequence. lying on your back, cross one leg over the other with the outside of the ankle resting on the opposite knee. Either place our hand on the knee to create pressure OR reach your arm through the triangle between your legs and clasp your hands around the back of your leg of the non-bend side. Keeping your shoulders on the ground and a long spine, gently pull the hamstring towards your belly and feel a stretch to the opposite side. Repeat other side. Come onto hands and knees. Bring your left knee forward and place it near your left wrist, with your shin on a diagonal and your left heel pointing toward your right frontal hipbone. Maintaining a square hip alignment, shimmy your right toes back until your right thigh releases to the floor. Move your left foot and shin toward the front of your mat, aiming for your shin to be parallel to the front edge, and flex your foot to protect your knee. If you wish to go deeper: using your arms for support, walk your upper body to rest your forehead on stacked fists or on the ground. Repeat other side. Sitting tall with your knees bent, feet on the floor. Slide your left foot under your right leg to the outside of your right hip, and lay the outer leg on the floor. Then, stack your right leg on top of the left. Be sure the right ankle is outside the left knee (i.e., sole is perpendicular to the floor). If you are more flexible, slide your left shin forward directly below the right; otherwise, keep the left heel beside the right hip. 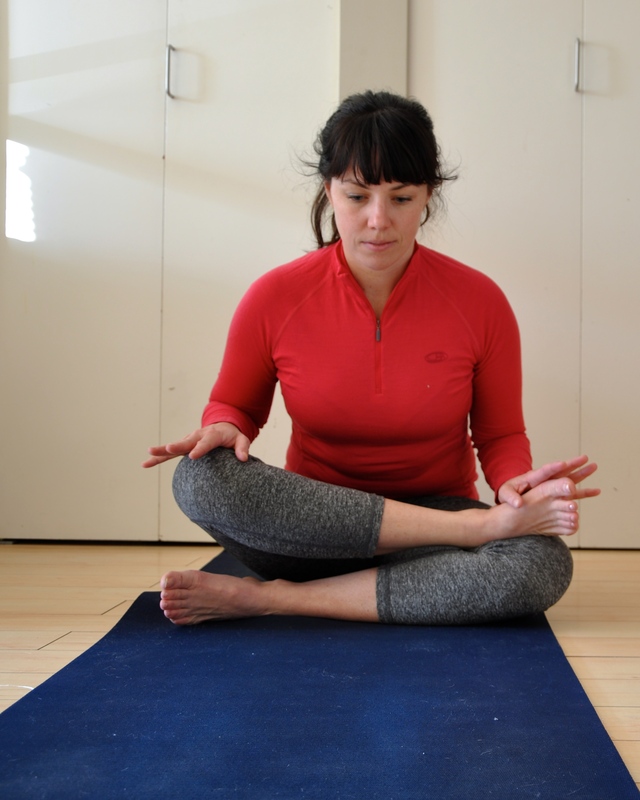 If you’re tight in the hips, simply sit with your shins crossed in Sukhasana (Easy Pose). Repeat other side. 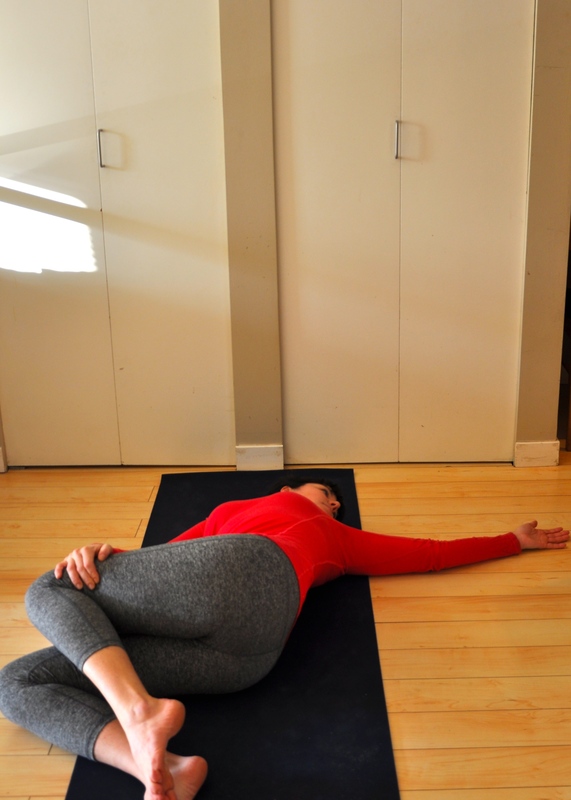 Lie on your back and draw both knees into your chest. Open your arms to the side like wings and drop the knees to one side, turning your gaze to the opposite side. Place hand onto of outer thigh to add more resistance to your twist. If your shoulder/hips begin to float up, place a blanket under the shoulder or a bolster along the spine. Repeat other side. happy hips = happy sleep! much love. Before 2013, we didn’t really know the answer to this question. 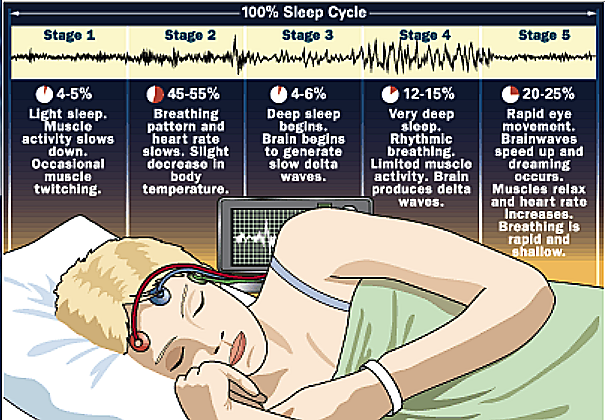 We knew that our brains and bodies work better after sleep. But what we didn’t know, until now, was why. Scientists report the first major mechanical reason our brains need to sleep in Science (Xie et al., 2013) — certain cleaning mechanisms in the brain work better when we shut the brain down. Similar to how dump trucks drive around pre-dawn hours because there’s less traffic, our brain’s cleaners also work best when there’s less going on. We feel restored after sleep because of the active clearance of the by-products of neural activity that accumulate during wakefulness. 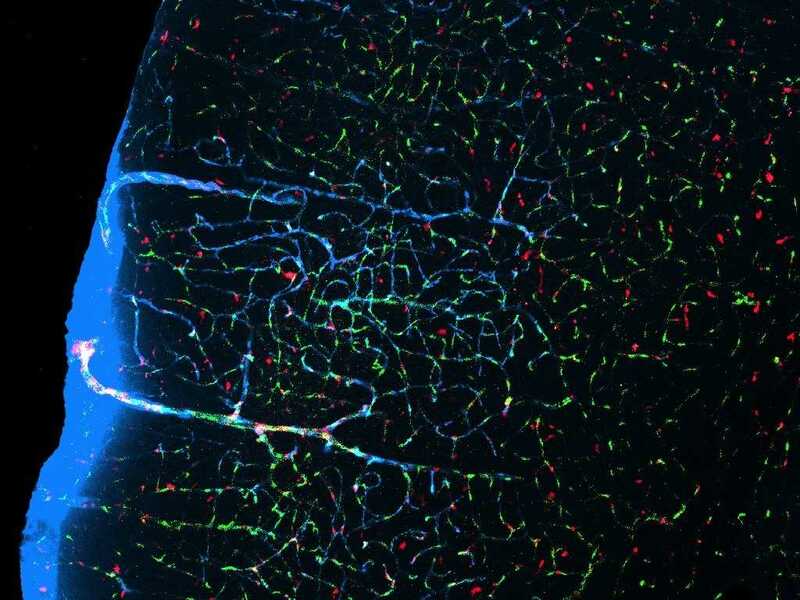 In brain tissue during sleep, cerebrospinal fluid flushes out toxic proteins that build up during the day, including the kind that are responsible for neurodegenerative diseases (*blue channels in the picture). Also, our brains consolidate memories during sleep. For our bodies, sleep allows our muscles, bones, and organs to repair and keeps our immune system healthy. … All the more reason to get some shut-eye! much love. … what do these 3 things have in common? Early detection of PD. 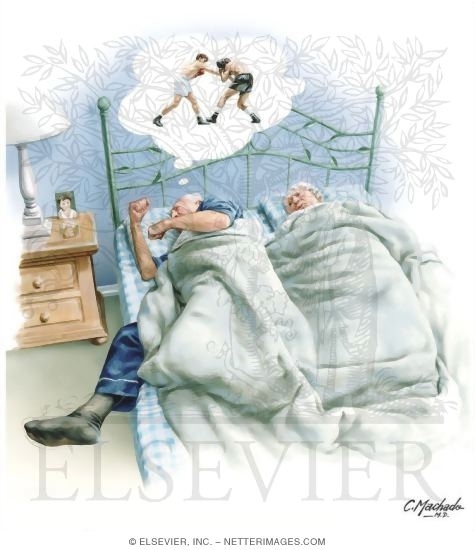 New research shows that hyposmia (loosing sense of smell), rapid eye movement sleep behavior disorder (RBD), and constipation, may be early Parkinson’s disease manifestations that reflect the underlying alphasynuclein pathology (the degeneration that is happening in the brain!) as well as predict subsequent onset of motor manifestations (Ravina & Aarsland, Mov Disord 2013). Also, recent prospective (it means the researchers followed patients for 4-years) study shows that patients with RBD have increased cognitive impairment on neuropsychological testing (Postuma et al., Mov Disord 2012). The results showed that 48% of persons with RBD developed some cognitive impairments (especially hallucinations and some cognitive fluctuations), compared to 0% of patients who did not have RBD. This gives us an indication that we should watch RBD diagnosis in Parkinson’s disease closely as RBD may be a good marker of cognitive impairment subtypes associated with Parkinson’s. … so ask your bedmate and talk to your doctor about how do you sleep at night. much love. Recently, a systematic review of 16 scientific studies was published on the effects of yoga on depression, schizophrenia, ADHD, sleep complaints, eating disorders and cognition problems (Murali Doraiswamy et al., Frontiers in Psychiatry 2013). This review found that a yoga program can improve biological factors related to mental health and have similar benefits as antidepressants and psychotherapy. Physiologically, yoga affects neurotransmitters, inflammation, oxidative stress, lipids, growth factors and second messengers, all of which influences mood and emotional well-being. According to this study, other benefits of a regular yoga practice included 40% reduction in depression symptoms, improved sleep quality and reduced need for sleep aids. The scientific evidence in support yoga practice on psychiatric disorders is “highly promising” and showed that yoga may not only help to improve symptoms, but also may have an ancillary role in the prevention of stress-related mental illnesses. … and since depression is the biggest threat to the welfare of people with Parkinson’s disease (HERE and HERE and HERE), this makes yoga for Parkinson’s even more important (Yoga for Depression in Parkinson’s). much love. **Note: The National Center for Complementary and Alternative Medicine (NCCAM) says people should not replace conventional medical care with yoga. Nor should people who practice yoga postpone seeing a health care provider. Patients should tell their doctor about any complementary health practices they use. Anyone with a medical condition should check with a health care provider before starting yoga. Nadi (=”channel”) Shodhana (= “cleaning” “purifying”) Pranayama is an alternate-nostril breathing exercise. The right hand is placed in Mrigi Mudra (a Sanskrit word meaning “to seal, close, or lock up” or “gesture”) by pressing your hand into a fist with your index and middle fingers firmly into the base of your thumb. Stretch out the ring and pinky fingers. Keep your pinky relatively straight, but curl your ring finger slightly; the idea is to “blend” the two fingertips into one. Open right nostril and exhale slowly through the right nostril. Repeat step 1. This is one cycle. Repeat 3 to 5 times, then release the hand mudra and go back to normal breathing. Benefits include lowered heart rate, reduction in stress and anxiety. This breath is also said to synchronize the two hemispheres of the brain (oh so beneficial for Parkinson’s disease!) and encourage prana (life force energy) flow. This breathing exercise is great for quieting your mind before beginning a meditation session, and it is also a soothing practice for calming racing thoughts and anxiety if you are having trouble falling asleep. Try it to feel more balanced and calm. much love.